This might just sound like one of the strangest ideas ever for a book, but Michaela Schubert has taken two seemingly separate topics and combined them in a brilliant attempt to enrich lives everywhere. I’m working on a book project about Doctor Who and the autism spectrum, and I am desperately trying to get as many people as possible to tell me a little about their own experiences with the show. The absolute most important part of a project like this is to get as many different viewpoints as possible. You don’t have to have seen a lot of it, you don’t have to be familiar with the classic series, you don’t have to have a particular spectrum condition (or any diagnosis at all). Any input at all is welcomed and greatly appreciated. But this isn’t just some random poll. Michaela is a PhD graduate student at the Pennsylvania State University of Medicine, researching “chromatin higher-order structure during mitosis and cell differentiation”. You know, the usual. 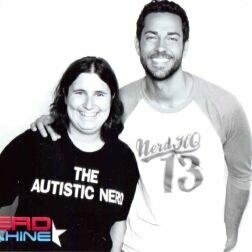 She’s also a writer, an Aspie, and a Whovian of the highest order, all of which makes her forthcoming book about Doctor Who and the autism spectrum a very personal journey indeed. The questionnaire can be viewed online as a PDF or DocX, and you don’t necessarily have to answer every question; answer as many or as few as you’d like, with as much or as little detail as you’d like. You can also request to remain anonymous, or you can choose to be quoted or paraphrased based on your responses. And when you’re done, help Michaela complete this book by submitting your questionnaire via E-mail at dw-autism@hotmail.com. Help make a difference. Help chart the influence of Doctor Who among those who need it most. Help Michaela Schubert complete this fascinating, original research about autism, those who have it, and those who don’t. All it takes is a quick E-Mail. If there was a pill that could make your autism/asperger’s go away, would you take it? Short answer: no, I wouldn’t. Long answer: I like being me. I wouldn’t want to change myself , sure I have difficulties but so do many people who aren’t autistic. I am, as some may a little odd. Thing is, I like being odd. I never as a child wanted to join the other children like robots liking the same things (spice girls etc.) To me, the word “weird” is a compliment. I am a dog person. I understand dogs so very much more than I understand humans. Humans are strange and contradictory and have social protocols that range from odd to baffling. Dogs on the other hand, are totally reasonable and very rarely confuse me at all. I have been told that there is a good likelihood that my ability with dogs comes from the fact that I am on the autism spectrum. My response? Awesome! If I were to stop being an Aspie, I would lose all of that. I don’t even know who I’d be any more, as these are all very important parts of my personality and identity.